There are six missions in this game, in each missions, there is instruction to tell us the basic, what is the objective and how to play it. Usually people just go skipping the instruction, after playing the game, though, I fully recommend not skipping the instructions, because you can learn more by watching them. First mission, Air Surveillance, finding the citizens by using helicopter. In this mission you must cover as much ground as possible and finding scattered group of citizens. The game play is quite easy, but the mission is clear. Usually in disaster, whether it is natural or man-made, the first instinct for people is to flee from the source of the problem and searching for safety. In the confusion, people will be scattered, and some of them will be gotten stuck at some place that hard-to-reach. It is a necessity to find them. Second mission, Energy Pacs. In this game, you must produce a balanced diet of rice, cooking oil, beans, sugar and salt within a budget of only 30 cents per day with a nutritionist. In my opinion, this game is the hardest one because at the first and second time trying, I did not get the perfect combination. When you are playing this game, you will know that our body needs their rice (carbohydrate) and their beans (protein) from the result and the commentary provided. Usually, in critical situation like natural disaster (like those that happened in my country, the boxing-day tsunami or the Mount Merapi eruption), people usually help with easy-to-pack and easily provided food like instant noodles. Instant noodles are fine for first aid for hunger, but for the long built, you must need to provide other food too, otherwise, the victim can get malnutrition. Third mission, Air Drop. In this mission you must drop food supplies in a target zone, of course you must calculate about the wind. At first the game play will make you confused and you cannot get perfect scores, but after a few tries, you will make it safely reach the drop zone. The real life situation of this case happen when you send the food to remote places, whether it is naturally remote or the road get blocked because of the disaster. As far as I know, sending food by plane and helicopter is expensive, so you can not waste the food by making them broken, missing the drop target and hurting people or destructing building, or dropping the food in place that can be reached. Fourth mission, Locate and Dispatch. As a non-profit organization, WFP must organize how to get their supply so that they can get the best offer. There are people who do donation for people and some of them offer lower price. In this mission you must co-ordinate supplies of purchased and donated food from around the world. It is like a combination of management and puzzle, I think. You must make sure that you can fulfill the stocks with the less money. Fifth mission, Food Run. In this mission you must use road vehicle to supply food and make sure that the food will safely reach the intended destination. Like a real life civil war, you will find that there are safe road with rough terrain and quick way that going across the conflict zone. There are also mines and people asking for food in the middle of your way. You must clear all of them and if you are not, like in real life, your food supply will decrease or worse, cannot reach their subject. Sixth game, Future Farming. In real life, WFP help people, yes, but the people must make a life for themselves and being independent too. This objective is reached by investing in the right places such as training and school. In this mission you will simulate the investment of using food aid to help a village develop over 10 years. By using this mission you can also know that investing in training (or food production) is important, so that the village can provide food for themselves. The developer chooses to make the game not as 2D but as 3D, I can assume that this decision made to make this game more serious and more realistic. It helps this game to reach the mission of making people aware of the issue of world hunger more because you can imagine more vividly about the real life situation. The other thing that I like about this game is that this program is available in 9 languages to download, each has Windows and Mac option on it. With this choice, the installation file can be smaller without all the language packs. In my opinion, there should be a Linux option too, but Linux user can circumstance this problem by using Windows Emulator to play the game, so that won’t be the problem. In the end, after finishing this game for less than one hour, you will know how WFP works in real life. Reading the premise of Food Force as Educational Game, adult usually does not intend to touch this game. That is a pity though. I recommend adult and especially children to play this game at least once to know how that in this world there are people who are less fortunate than us and still suffering from hunger and other problems and be inspired by people who try their hardest to help them. For teacher, there is also lesson plans to help them teach this issue at school. 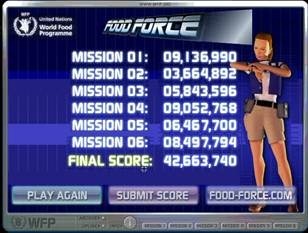 This game garnered good responses, inspiring the development of an open source program, Food Force 2. Posted on October 27, 2011, in Playing, Plugging and tagged 3D, download, food, food force, Future of Asia, game, help, review, wfp. Bookmark the permalink. Leave a comment.